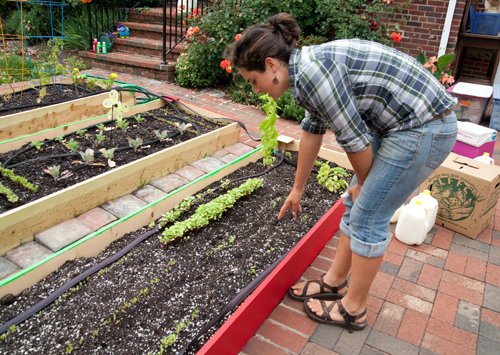 Say you want to grow vegetables in your yard, but you’re just not sure where to dig a garden. Or you’re a novice and want some expert help. 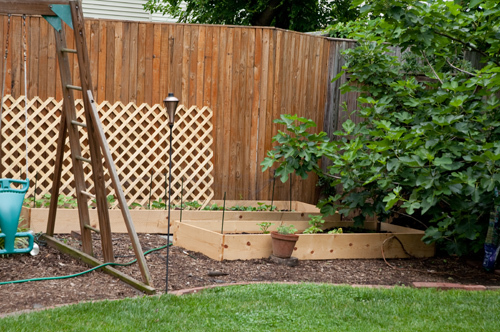 Lucky for you, a very knowledgeable green thumb is just a call or email away. Natalie from the D.C.-based garden and landscaping company Love & Carrots lives in Del Ray and is helping to expand their service to our area. I met with Natalie the other day to visit one of the gardens she helped set up for April and her family in Del Ray. First, Natalie met with April and her family to see her space, take measurements, pictures, and chat about their vision and priorities. April had a community plot before and is generally interested in growing and eating homegrown food. Faced with the work of assembling everything (soil, beds, transplants, seeds), April just needed some help getting started. Her family decided to make the most use of the sun-filled space in her front yard and convert a big 15 by 10 foot section of lawn to a vegetable garden. Natalie worked with April to construct these awesome raised beds. April laid extra bricks from her backyard as paths. April’s daughter is helping to paint the beds in bright happy colors and she gets her own pots to tend to as well. Natalie offered a drawn-to-scale garden design so April could visualize and approve her new edible landscape. All of the gardens incorporate herbs, companion plants, nutrient cycling, and plan for multiple plantings over the season. Companion plants are plants that grow well next to each other. For example, tomatoes and basil or broccoli and dill. Succession planting helps soil maintain a good nitrogen content because some plants take nitrogen out of the soil and some put it back into the soil. For example, you don’t wait to plant potatoes in the same place every year because they require high amounts of nitrogen in the soil. April also found space in the backyard to cultivate. Natalie periodically stops by her client’s gardens for maintenance visits weekly, monthly, or as-needed. If April goes out of town, she can call Natalie to harvest the produce for her. The day we stopped by, Natalie took some time to talk about the newly emerging seedlings and to counsel April on thinning the lettuce. Something else that’s really cool about Love & Carrots: They work with an experienced vegetable preserver to help you can your produce. What’s not to love about that. 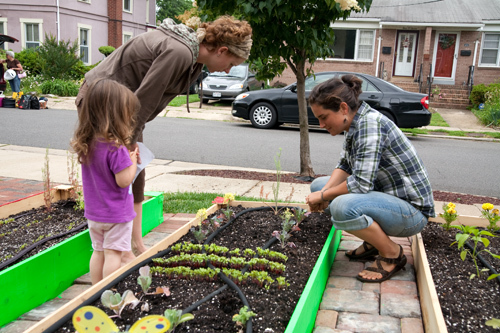 On the Love & Carrots Web site, you can see sample designs they’ve done in D.C. on rooftops, for town homes and row houses, as well as an educational herb garden for the French Embassy. For a consultation about your own gardening needs, you can reach Natalie at natalie [at]loveandcarrots.com. Interesting…I contacted Love & Carrots through their website back in early March, I think, and they didn’t even bother to respond to my inquiry email for several weeks – and when they finally did, it was just to tell me that they had no availability for months. I had no idea they’d since established an Alexandria branch based right here in Del Ray – wish I’d known sooner as their service seems to be exactly what I’m looking for! 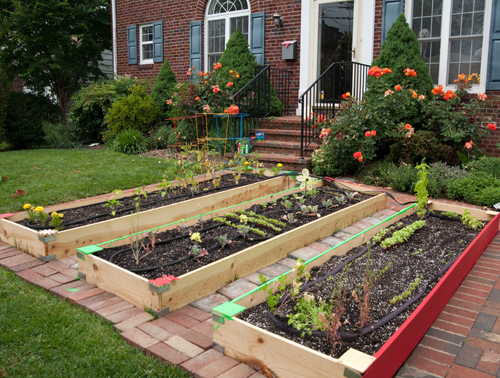 Beautiful…it shows that a garden can fit into any space! My grandfather was a farmer. I have some practical knowledge like this, although I have been separated from country life for so long, I am considered the city mouse by now. 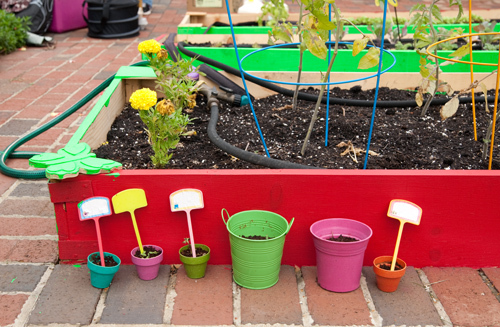 It is nice to see people like Natalie sharing their love for gardening! Natalie is very knowledgeable and professional and did an excellent job in design. I highly recommend her work and Love & Carrots!